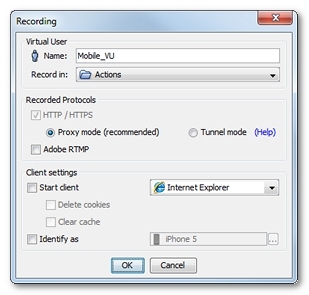 Recording in proxy mode is applicable to all secured web applications and to most secured native applications. Before recording a secured application in proxy mode, it is necessary to install the NeoLoad root certificate, as described in Secured applications. Information: When a secured native application cannot be recorded in proxy mode, it is necessary to record it in tunnel mode, as documented in Record a secured application in tunnel mode. In NeoLoad, the Design section gives access to the Start Recording toolbar button. The Recording dialog box makes it possible to define the new record. To record in proxy mode, the Proxy mode option must be selected. It is recommended to uncheck the Start client option as the mobile device itself generates the traffic. As soon as the recording is started in NeoLoad, the mobile application can be used. NeoLoad catches the HTTP traffic of the recorded application to create the test scenario content. When all actions on the mobile application are completed, a click on the Stop Recording button in the recording bar displays the Post-recording Wizard to configure the recorded scenario. Information: For more information about recording a secured application, see Recording an HTTPS application. For more information about the Post-recording wizard, see Post-recording wizard. Once recorded, the scenario can be checked and edited in the Design section of the NeoLoad Controller. For more information, see Virtual User Profiles. On an iOS device, send an email with the certificate file in attachment to yourself. Open the email on the mobile device. Click on the attachment to install it. On another device like Android, check the installation policy provided by the mobile vendor. In the General preferences of your mobile device, go to About > Certificate Trust Settings and enable the "Full trust for root certificate" option for the NeoLoad recorder certificate. In the Design section of NeoLoad, click Start Recording. In the Recording dialog box, specify a new Virtual User. Start your application on the mobile device. Perform all the actions to record. When you are done with the recording, click Stop recording.